Great for pubs, clubs etc - write on & wipe off! 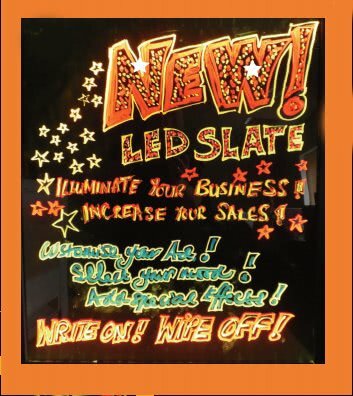 Illuminate your business and increase your sales with the LED slate sign! This LED slate is a fantastic new sign that uses LED lights to illuminate. Great for use in pubs, clubs, bars, cafes, restaurants, hotels and shops for drawing attention to offers or deal of the days and equally great in a home games room for keeping score or leaving messages for each other. By using LED lights the sign is so energy efficient and environmentally friendly - LEDs last up to 80% longer than conventional bulbs and there is no need for any other external lighting to illuminate the writing. You can also choose to have a transparent slate or a waterproof slate. This product is delivered by our dedicated 1 man courier service. Delivery is usually within 3 to 5 working days. Customers will be contacted by email with a delivery date.